A lot of people don’t like Donald Trump. Both the petulant #NeverTrump partisans and Hillary’s staunchest constituents actively hate him with an unholy passion that ironically rises to the level of religious fervor. Both utterly fail to see and/or reject Mr. Trump’s perfections, though Hillary’s supporters must be excused for this as they’re deficient in math skills. Yes, this is correct. Donald Trump’s perfection is the perfection of the fundamental language of the universe, math. 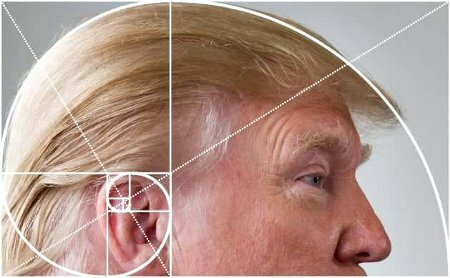 As one can see, with the inclusion of his much lampooned – even by me – hairpiece, The Donald is the Fibonacci Spiral, which is an approximation of the Golden Spiral using the first eight numbers of the Fibonacci Sequence – 0, 1, 1, 2, 3, 5, 8, 13. As the very nature of growth in nature follows the Fibonacci Sequence, Mr. Trump could not inaccurately be described as possessing the perfection of growth in symbolic language. This entry was posted on Saturday, August 27th, 2016 at 12:22 pm and is filed under 2016 Election, Humor, Politics. You can leave a response, or trackback from your own site.